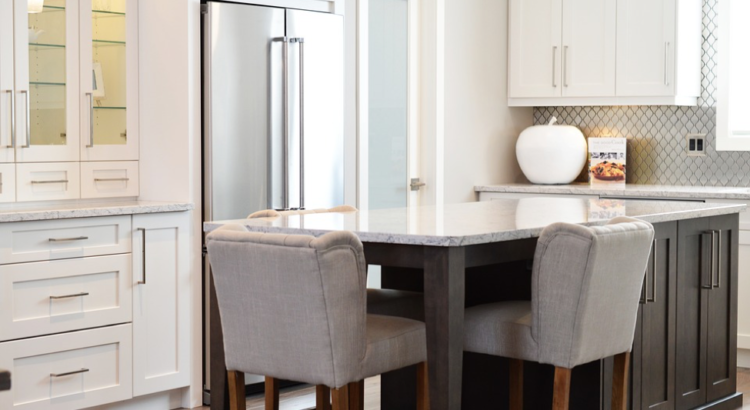 If it’s your first time owning a home, it might surprise you to realise that the choices for a kitchen worktop aren’t just stone, wood, and cement. There is a wide variety of worktops to choose from, which can have their pros and cons depending on your home’s theme. Finding the one that best suits your home’s aesthetic is a matter of understanding the material and knowing what accents to pair it with regarding furniture and flooring. Listed in this article are some of the popular choices for worktops that could be a great addition in finalising your kitchen’s motif. Authentic items are as glamorous as they are problematic. If you’re someone who finds the rustic wooden look in a home attractive and elegant, then you might reconsider its practicality when it comes to worktops. Though it does pair up well with wooden furniture, similar to natural stone and quartz, wooden ‘butcher block’ counters have the same problem – being porous – which means they can age quickly with time and overuse. Besides being one of the least favourable worktops when it comes to handling liquids, it’s also a bother to deal with when it comes to being susceptible to deep scratches. A Silestone worktop makes for a great alternative to your current choice. Not only are Silestone worktops made of composite materials, but they also have one up over natural stone, since they don’t need a sealant to make up for porous layers. Silestone might be a little bit more expensive compared to other stone surfaces, but it does offer great benefits such as having microbe killing components together with being harder to stain. Laminate is a composite material made of multiple layers of kraft paper mixed in with resin which make it the most budget-friendly choice in this list. Like other composite materials, laminate is famous for being able to mimic textures from natural materials such as wood and stone. But laminate is hardly the best choice when it comes to dealing with scratches and high temperatures; this makes it the least suited for restaurants that use the worktop for numerous dishes lined up at the kitchen straight off the stove. Quartz and engineered quartz are distinct from each other; quartz is a naturally occurring material while engineered quartz offers a mix of a composite polymer resin which makes it have non-porous layers, a prime choice as a contender for worktops that are resilient to tough stains and bacteria growth. It can be one of the more expensive materials on this list, but high performance warrants a high price. Natural stone materials like marble and granite are elegant to look at with their organic design which makes them eco-friendly and heat-resistant. However, they are classified as porous which can absorb liquids if the worktop isn’t coated. You could enlist a professional to have the worktop sealed or to order a pre-sealed slab, but the price in itself is high enough for you to consider alternatives first. Do I really need to insulate my garage?